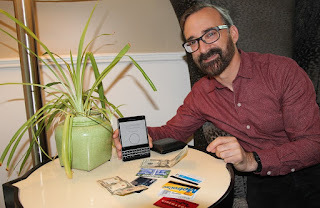 Bill Maurer with cash, cards, and a new payment app. Apple Pay, Venmo, Square – few aspects of modern life are changing more quickly than systems for moving money. Ethnography, participant observation, domain analysis – few academic fields require as much time and patience as anthropology. Yet the anthropology of finance is more urgent and relevant than ever, says Bill Maurer, professor of anthropology and dean of social sciences at the University of California Irvine. Maurer, a leading figure in the social sciences of finance, was at Cornell to help kick off the Institute for African Development’s symposium “Mobile Money, Financial Inclusion, and Development in Africa.” His talk, “The Problems of Cash and the Perils of Cashlessness: Researching Mobile Money and Payment Infrastructure after M-Pesa,” looked at the “Cambrian explosion” in payment systems after the African telecommunications giant Safaricom launched M-Pesa, its cell-phone-based service, in Kenya in 2007. That explosion has brought millions of people into the financial system, making everyday payments easier while providing access to credit and other services. That can make a huge difference for people who need money for seeds, farming equipment, or other modest but crucial investments. “That said, there are some pretty big risks in the extension of credit to people who haven’t had it before,” Maurer said in an interview. He cites the case of South Africa, where workers began receiving their paychecks by direct deposit at the same time that banks got the power to reclaim debts directly from their clients’ accounts. 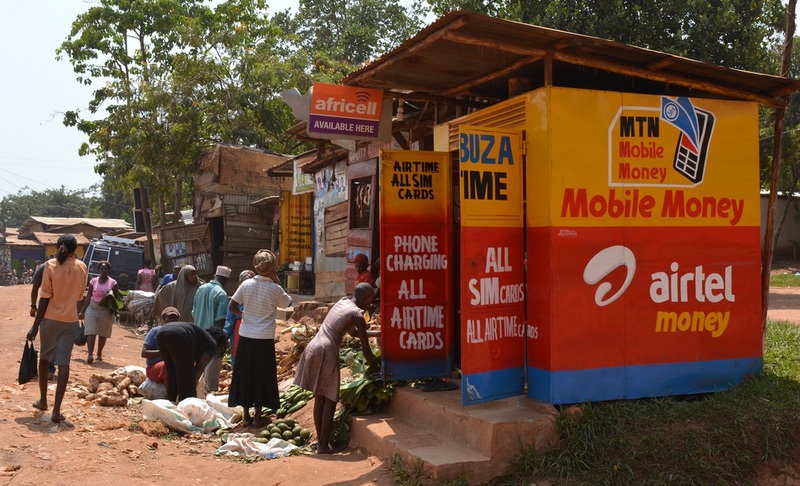 Mobile money grew out of the trade in phone card airtime as a substitute for cash in Africa. 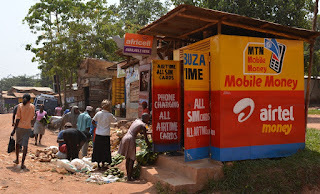 This retail stand is in Uganda. “Anthropologist Deborah James showed how folks went into a financial tailspin because they found they couldn’t negotiate with the bank the way they could negotiate with their relatives. With the bank, if you didn’t pay when it was due, they just took it,” he said. In societies where loans, gifts, and other forms of exchange are central to social cohesion, the “financialization” of transactions can damage more than just the solvency of an individual borrower. That is where anthropologists come in. With his colleagues at UC Irvine, Maurer founded the Institute for Money Technology and Financial Inclusion to bring together social scientists, technology developers, and financial system practitioners from around the world, particularly from developing countries. The institute has set up a regional center in Pakistan and is planning to establish others in Mexico and Senegal. That is because the technology and culture of finance can vary dramatically from place to place. Cultural issues can arise much closer to home. Maurer recently gave a talk to bankruptcy judges in Orange County, California, near where he teaches. They told him about recent Southeast Asian immigrants whose ideas of communal or familial property can put them at odds with a legal system that sees ownership as an individual responsibility. “I had one judge tell me that she had a back-and-forth with a guy facing bankruptcy where she was saying, ‘You don’t understand, this is how American law works’ and he was saying, ‘No, no, you don’t understand, this is how gifts work,’” he said. Maurer sees meeting with practitioners as an important part of his work. “I think that we have a fundamental duty to be willing to speak to people about what we’re doing and the insights that we have to offer,” he said. “Too often I think, especially in anthropology, we adopt this role of cultural critic, which means we come with a holier-than-thou perspective on everything. When we deal with people outside academia, doing work that touches on our own, we either get judgmental toward them or we think of them as data.